The number of migrants attempting to enter Britain illegally will double this year, the director of the UK Border Force has said. Over 30,000 migrants have attempted to enter the UK illegally in the past 10 months, a figure which is nearly double the 18,000 recorded in the year 2013/2014. Sir Charles Montgomery, director of the Border Force, told MPs in the House of Commons that the agency recorded 30,180 “detections” in the 10 months to the end of January 2015. He said he could not say for certain whether the rise was due to an increase in the number of migrants attempting to enter the UK or to more effective policing. Montgomery’s comments come a month after the mayor of Calais said migrants were “willing to die” to come to Britain. Estimates suggest at least 15 people were killed attempting to cross the UK border last year. 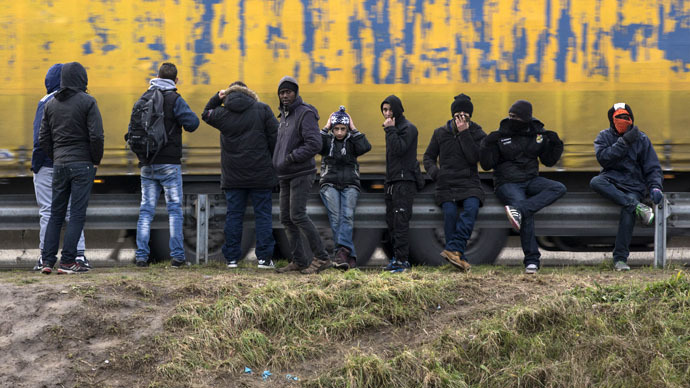 Giving evidence to the Home Affairs Select Committee, Montgomery said there were around 3,000 migrants based in Calais who intended to enter the UK. He said British immigration officials had detained more than 6,000 illegal migrants who successfully entered the country from April to the end of December 2014. This number is equal to more than 20 a day. Montgomery said this statistic was “flaky,” because some migrants falsely claim to have entered the country when they may have actually overstayed their visa. “The best that I can offer is that this year there has been about 6,000 detections in-country,” he told MPs. He added that border officials were not able to stop every single person attempting to enter the country. “I cannot look this committee in the eye and say I can operate 100 percent control so 100 percent of clandestines will not get across the border,” he said. The mayor of Calais, Natacha Bouchart, last month warned more than 2,500 migrants were “willing to die” to come to the UK. She said many saw the country as an “El Dorado” filled with jobs and opportunities. The death toll for migrants killed attempting to enter the UK from Calais reached 15 last year, according to local charities based in the area. Calais Migrant Solidarity (CMS), an online group which documents police harassment of migrants, say the figure could be higher as many deaths are covered up or simply go unreported. On December 12, a Sudanese man was crushed under the wheels of a truck driving along the M25 after successfully crossing the border, according to CMS. A 16-year-old girl from Ethiopia was killed on October 20 when she was knocked over on a busy Calais road as she tried to board a truck heading to the UK. In another headline-grabbing statement, Montgomery told MPs that waiting times at the Calais border are likely to increase from April as a new system of checks is introduced. Montgomery said the new passport checks will be postponed until April 8 to avoid the Easter holiday weekend. The new checks will mean border officials record passport information for nearly every traveler before passing the details on to the Home Office, which will use the data to find immigration offenders. Holidaymakers have been told they may face long lines at the Eurotunnel and ferry ports. While the checks apply to most travelers, coach parties with children under the age of 16 are exempt.